The United States Congress designated the Steens Mountain Wilderness (map) in 2000 and it now has a total of 170,202 acres. All of this wilderness is located in Oregon and is managed by the Bureau of Land Management. Located in Oregon’s high desert, Steens Mountain Wilderness is one of the crown jewels of the state's wildlands. Rising from 4,200 feet to 9,773 feet on Steens Mountain, it is some of the wildest and most remote land left in Oregon with 68.2 miles of trail. You will find this area covered with sagebrush, juniper, various species of bunchgrass, mountain mahogany, aspen, mountain meadow knotweed, and false hellebore. Common wildlife includes bighorn sheep, Rocky Mountain elk, pronghorn, coyote, sage grouse, and the Great Basin redband trout. The Wilderness receives approximately 12 inches of rainfall each year, at lower elevations. Summer temperatures at higher elevations are generally moderate. July is host to many 80 degrees F days and up to 95 degree days in mid-August. Nights tend to be cool, in the neighborhood of 55 degrees, but beware, it can freeze any day of the year on the Mountain. Of the Wilderness acres designated by the public law that created this area, under 60% are "cow-free", meaning that no grazing will be permitted. 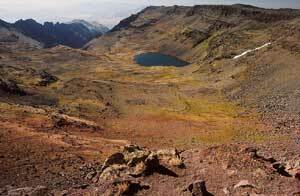 Planning to Visit the Steens Mountain Wilderness? How to follow the seven standard Leave No Trace principles differs in different parts of the country (desert vs. Rocky Mountains). Click on any of the principles listed below to learn more about how they apply in the Steens Mountain Wilderness.